Arnott and Vederoff Ancestors - This headstone is in the Crested Butte, Colorado, Cemetery. It is adjacent to those of John and Helen (Monro) Arnott. Euphemia was an aunt to John and had come to the United States in 1879, about 10 years before John Arnott. Mary was the daughter of John and Euphemia (Pitcairn) Hunter. 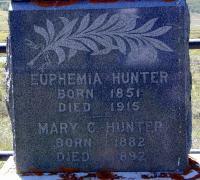 This headstone is in the Crested Butte, Colorado, Cemetery. It is adjacent to those of John and Helen (Monro) Arnott. Euphemia was an aunt to John and had come to the United States in 1879, about 10 years before John Arnott. Mary was the daughter of John and Euphemia (Pitcairn) Hunter.